UCCS Softball began their season on Jan. 26 at the MSU Denver Invite, a two-day tournament where the Mountain Lions played four games. There, the team faced off against the MSU Roadrunners and the Cougars from the University of Sioux Falls in South Dakota. 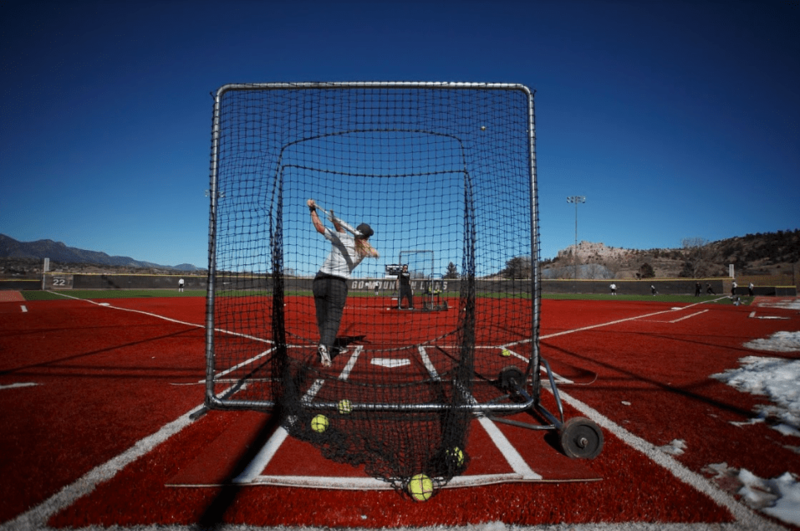 After finishing last season with a 27-27 record, Head Coach Ricki Rothbauer-Stubbs said UCCS Softball is fully capable of a 30-win season this year. After bowing out early in the RMAC tournament last season, Rothbauer-Stubbs said that the team is motivated to not repeat last season’s tournament play and that they’ve set high goals in terms of finishing out games and finishing high in the conference. With uncertainty at positions such as center field and first base after senior departures, Rothbauer-Stubbs is looking at fresh faces to replace those who have left. With twelve games during the preseason, the coaching staff has flexibility to survey their options by trying out different lineup combinations. Rothbauer-Stubbs said the depth of hitters is one of the team’s biggest strengths this season. Rothbauer-Stubbs also said pitching depth is another strength of the team. “We’ve always kind of been two strong pitchers, [but] this year we have a really strong three, so we’ve got three kids who can start any game we put them out there. Rothbauer-Stubbs was quick to note that the team has had three starters in the past. But in terms of balancing out being able to start and how long the pitchers can go in a day, Rothbauer-Stubbs thinks this is the strongest staff that they’ve had. In regard to what needs to improve, Rothbauer-Stubbs pointed to the team’s struggles with covering bunts. “Our team doesn’t bunt a lot, but we do have a number of teams with very fast runners who bunt against us. I think sometimes as a team you can fall into the pattern of defending the way that you would be defended instead of defending against actually what’s in front of you,” said Rothbauer-Stubbs. “That’s something that we really want to brush up on: making sure that we’re not letting the shortest hits on the field be the ones that set up us to get behind from a defensive standpoint. Between that and just making sure that everyone’s in the right coverage, taking care of the ball for our pitchers is the biggest thing there,” said Rothbauer-Stubbs. The team’s first home game is Saturday, Feb. 23 at noon against CSU Pueblo.